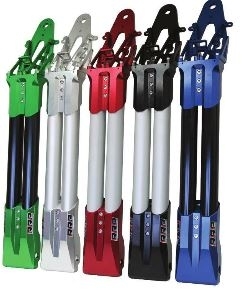 • Extra Strong design using 6061 T6 aluminum tube. • Quickly adjustable from +1 inches to -1 inches. A Stock Pole is 38” from pivot bolt to turn plate mounting bolt. • Billet Poles are supplied with both Yamaha & Kawasaki pole bushings. • Ships in 24 x 6 x 10 inch box. installation, you must follow the supplied installation instructions. proper hood clearance during the final fitting process.